that connect to the customers CE devices. A. The CE-facing interfaces on the PE devices must be configured as trunk ports. B. The CE-facing interfaces on the PE-devices must be configured as access ports. C. The PE-facing interfaces on the CE devices must be configured as trunk ports. D. The PE-facing interfaces on the CE devices must be configured as access ports. From the question, the customer wants to pass tagged traffic from multiple VLANs, for the customer to be able to allow multiple VLANs through its interface, the port must be set as Trunk port. The Service Provider must configure the PE interface as access going towards the customer, since the PE is the access to service provider network for multiple customers. the optimal packet size to send across your tunnels? 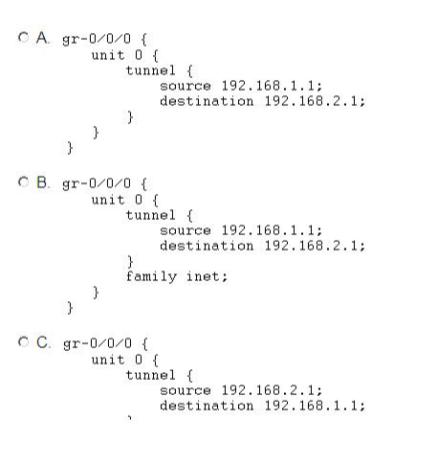 IP tunnels are used to carry traffic that otherwise is not routable over a public IP network like the Internet. This traffic could include IPX, AppleTalk, or IP traffic that uses RFC 1918 addressing. 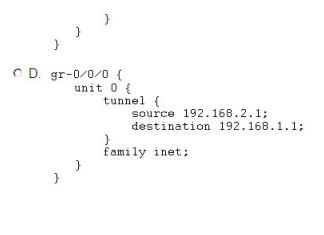 You can also use IP tunnels as a backup link in case a link failure. To Enable path MTU discovery for IP-IP tunnels, "set system internet-options ipip-path-mtu-discovery"
has asked you to add these two devices to the existing ISIS network. Router-X has an external peering session to 10.0.21.2 and several internal peers. How can the policy referenced in the exhibit be used to make sure routes are usable? A. Apply nhs as an import policy to internal BGP peers. B. Apply nhs as an export policy to internal BGP peers. C. Apply nhs as an import policy to external BGP peers. D. Apply nhs as an export policy to external BGP peers. Since Router -X has an external peering session to 10.10.21.2, it shows that 10.10.21.2 is in its routing table. The rule is that since the Router-X is going to let the internal peers know about routes on its routing table, it has to export it to the internal peers, because it is taking the routes from its routing table to the internal peers via iBGP protocol. The process of moving routes between a routing protocol and the routing table is described always from the point of view of the routing table. That is, routes are imported into a routing table from a routing protocol and they are exported from a routing table to a routing protocol. Which Junos platform supports provider bridging? The answer to this question is C. The reason is that Provider bridging introduces a second type of VLAN tag for the purpose of delineating the service provider's tag from the customer's tag. This service provider tag is known as the S-Tag, while the customer continues to use the original VLAN tag, known as the C-Tag. SRX series devices is used for Firewalls and not necessarily for connecting customers. Shouldn't this be C instead of B? Referring to the exhibit, which statement is correct? A. An RE switchover is likely to result in BGP disruption, but no dataplane impact will be seen. B. An RE switchover is likely to result in BGP disruption which will also effect the dataplane. C. The system is not yet GRES ready, you need to wait for kernel synchronization to complete. D. The system is NSR ready and a switchover should be hitless to the BGP control and data plane. To determine whether BGP synchronization is complete, you must check the Protocol state and Synchronization state fields in the output of "show bgp replication" on the "backup Routing Engine" usually RE1. The Protocol state must be "idle" and the Synchronization state must be "complete". If you perform NSR switchover before the BGP synchronization has completed, the BGP session might flap. A. Level 1 adjacencies can form in the same (intra) area only. B. Level 2 adjacencies are formed between (inter) areas only. C. Level 2 adjacencies can be established either interarea or intra-area. D. Level 2 adjacencies can form within the same (intra) area only. A. The BGP session is idle on the backup RE indicating that the session will flap at switchover. B. The task replication process has completed on the master indicating a hitless switchover can be expected. C. The GRES synchronization process is underway and must complete before the protocol state can be checked. D. The BGP session is idle on the backup RE which is normal; it toggles to established at mastership change. The Kernal databasE status is 'Synchronizing" This is a red flag here, the kernel replication is in Synchronizing status which means that it is still receiving updates for the past 5 seconds, the kernel databaseE should show 'complete" for a hitless switchover, also 192.168.1.1 bgp neighborship is "idle", on the Backup Routing Engine, therefore the bgp session will flap on switch-over. BASIC STEPS NEEDED TO CONFIGURE GRE 1) Configure a GRE (gr) interface. The gr interface contains a local address and destination address. It comes up as soon as it is configured. You can even configure an IP address on the gr interface. (It is not mandatory.) 2) Configure a route to reach the destination subnet (End to End connectivity). You can configure either a static route through the gr interface or use a IGP (i.e. OSPF can be used for this purpose). Note that All interface configuration that would have an ip address of either ipv4 or ipv6 must have "family inet" or "family inet6"
An area border router (ABR) is a kind of router that is located near the border between one or more OSPF areas. It is used to establish a connection between backbone networks and the OSPF areas. 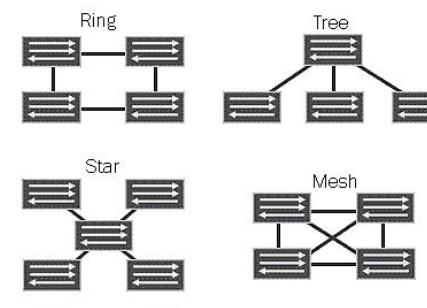 It is a member of both the main backbone network and the specific areas to which it connects, so it stores and maintains separate routing information or routing tables regarding the backbone and the topologies of the area to which it is connected. ABR only generates Type 3 LSAs. In type 3 LSAs are advertised networks from an area to the rest of the areas in AS. it floods ASBT summary Type 4 LSAs for connected network. ABR does not generate all Router LSAs such as Type 1(generated by each router) or Type 2 LSA generated by the Designated Router, etc. advertisement from an external BGP peer in AS 65555, and BGP advertisement from R3. The default BGP advertisement behavior is in effect in this environment. A. R1 will advertise the route received from R3 to R2 and its external BGP peer. B. R1 will advertise the route received from R3 only to its external BGP peer. C. R1 will advertise the route received from its external peer to R2 and R3. D. R1 will not advertise the route received from its external peer to R2 or R3. The default BGP advertisment behavior being in effect is only making reference to the BGP Split-horizon. The BGP split-horizon rule governs the route advertisements between IBGP peers, which specifies that routes learn via IBGP are never propagated to other IBGP peers. B. The RIB group can be applied to OSPF. C. The RIB group cannot be applied to OSPF. The correct answer is A,B	• The export-rib command tells the router, from which tables to take information. For any individual RIB group, only one table can be specified in the export-rib statement. • Conversely, the import-rib command tells the router, into which tables to place information. Unlike its counterpart, the import-rib statement can specify multiple route tables. From the exhibit, it shows that all routes from the inet.0 routing table will be imported to the User-a.inet.0 routing table.